Trend #4: Old Decorating Rules are Out… Zen is In! Where are People Spending the Most Money in the Bathroom? If you’re thinking about selling your home in the near future, the bathrooms are important rooms to consider. Even if you’re staying for a while, you may want to spruce up the bathrooms for your own enjoyment. It’s always a good idea to check out the latest design and decor trends. Next to kitchens, bathrooms are often the most expensive rooms to update, and they can make or break a home sale. A little research into what’s on trend is always wise if you plan to sell your home in the near future. The bathroom design trends we’re seeing for 2019 are eclectic and have a broad range, so you’ll be sure to find something that fits your home. My search around the world wide web has brought me several sources of reliable information…Elle Decor, Huffinton Post, House Beautiful and DIY Network, and, of course Pinterest, are faithful stand-by’s. Angie’s List has some great information about bathroom design trends for the coming year, and its’ a great resource to find contractors. Please note that this article contains affiliate links, read my full disclosure at the bottom of the page. The increased use of technology in our homes over the last few years is a well-known fact. Now we’re seeing it in the bathroom. 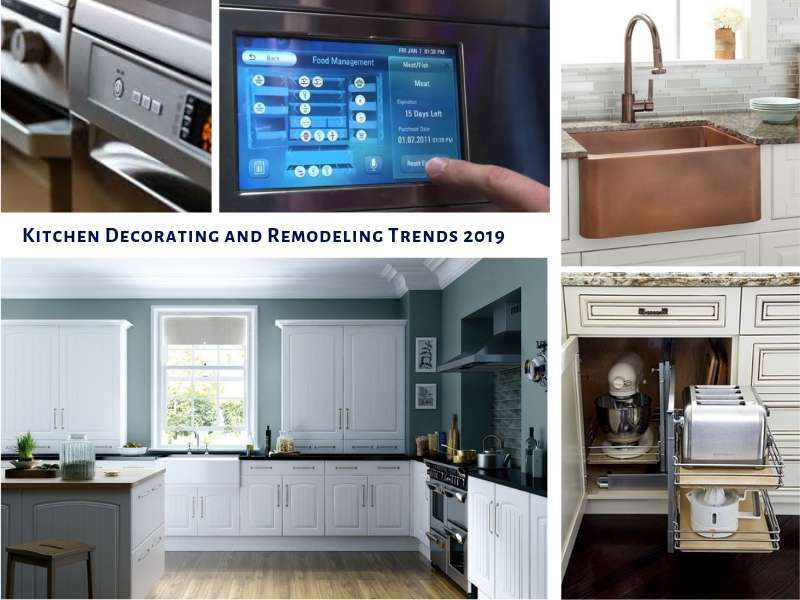 According to the 2018 U.S. Houzz Bathroom Trends Study, demand for bathroom technologies has increased each year for several years. Upgraded, high-tech faucets, LED lighting, and advanced electronics are in demand, but not just for the sake of the technology. Homeowners are looking for more control and convenience. You can create a custom showering experience more affordably. Consider a Digital Showering System…with smart features like a warm-up mode, a timer, and a way to pause water flow. Shower heads with LED lighting is on the rise. Heated floors are common these days. It is actually more cost-effective that most methods of heating. Dock your iPhone or MP3 player directly with your speaker-equipped, high-tech toilet so you can entertain yourself on the commode. While you’re not likely to invest $4,000 for a Kohler Numi toilet using this technology today, start looking for competitive models with lower prices as this technology becomes more available and in demand. Catch up on news and weather while you brush your teeth. Television screens are being integrated into medicine cabinets and vanity mirrors. The cost is still at a premium: $2,200 to $2,400 price tag. Plug your smart phone or MP3 player into your medicine cabinet so you won’t miss a call or song while getting ready for work or bed. A built-in jack keeps your unit charged (and away from wet countertops) and linked into a built-in speaker system. Remote control is becoming common in the bathroom…TV, stereo, windows and window treatments are easily controlled. There are smartphone apps for everything. For $300 for simple controllers to $3,500 or more for a complete luxury installation, programmable showers let you digitally set your preferred water temperature, volume, and even massage settings before you step in. To achieve a personalized showering experience, you’ll need a 120-volt power source, and a thermostatic valve and controller in addition to your standard shower head or heads. Luxury models may include a steam system, a wi-fi source for music, multiple body spray outlets, tankless water heater, and a secondary controller to start the system from another room. I don’t even want to find out how much these systems might cost, ha. It’s not just high-tech that’s bringing an “experience” to the bathroom. As the baby boomers plan to “age in place”, we’re seeing more master bath renovations to accommodate future needs. Sleek, low-profile linear drains are ideal for creating safe, zero-threshold showers. Unlike standard round drain covers that are typically mounted near the front end of a shower, these long, straight drains can be installed in different locations to minimize the slope of the shower floor. One popular location is at the outside edge of the shower, creating a wheelchair-friendly curbless shower. Many bathrooms renovators are ditching the tub for a high-end, curbless shower. More shower fixtures are offered in more finishes — including nearly invisible tile-in channel models that are largely covered by non-slip shower floor tile — are becoming the standard for upscale spaces. Accessible features such as seats and grab bars are common. The accessible tub is no longer limited to the high-walled, narrow-door format that dominated the market in the last decade. Newer models, such as Kohler’s Elevance, employ rising panels in front that give more of a traditional tub look with easier entry and exit. Others use standard hinged, sealed doors, but are increasing door width by several inches for better accessibility and appearance. Touch-free faucets are making now common in the bathroom. The prices have come down substantially from their first appearance, making them an affordable option for most budgets. The rapidly-expanding selection of porcelain, glass, and ceramic tiles makes it easy to find slip-resistant, low-maintenance floors that don’t skimp on style. Expect to see faux wood, linen, and uniquely-textured looks for tiled bathroom floors and walls. The texture adds both visual impact and better traction for wet feet. Water-saving toilets are more in demand. The flush that used to be 7 gallons a decade ago is now 1.2 gallons. Consider a double-flush version, or any low-flow toilet coming on the market that meets your style preferences. You’ll find them at home improvement centers from $100 to luxury showroom models for thousands more. The WaterSense label, launched in 2006 by the Environmental Protection Agency to promote water conservation by plumbing manufacturers and home owners, is becoming as well-known as Energy Star. Water-saving shower heads are the norm. Low-flow shower heads of today have beautiful designs, especially rain shower models. A typical shower head will use anywhere between 5 to 8 gallons of water per minute, while a low-flow head lowers that to 2.5 gallons or less with the same amount of water pressure. By adding air, not water to the mix, these shower heads put out strong water pressure. They’re available in every price range, from ultra-affordable standard heads to luxury rain showers. Body sprayers are common in today’s fixtures. They save water and they satisfy the growing interest in a custom spa experience that is so popular. Modern motion sensor faucets are increasingly available to homeowners. Most major bathroom fixture manufacturers have them. Modern bathroom design trends are moving towards a bathroom that fits in with the decor in the rest of the home. The color combinations, architectural designs, and a blend of luxury and comfort are more personal and individual. Today’s homeowners are demanding more style choices, more elegance and more choices in lighting and fixtures. Personal style reigns in the bathroom. A lot of the old rules are out, so go ahead and hang a chandelier over the tub. A touch of elegance adds to the luxury feel. Artwork is showing up in the bathroom…you might as well have something to gaze upon as you luxuriate in your own home spa! Natural and organic materials like natural stone, concrete, timber and timber veneers are increasing in popularity. Timber paneling reminiscent of the 70s sauna, but in an updated version, is making a quiet comeback. On trend with the rest of the home, designers are bringing plants, wicker, baskets and natural materials into the bathroom to enhance the spa-like feel. Along with the need for Zen in a complicated world, the bathroom styles are becoming more streamlined, hiding hardware and pipes, for a cleaner look. Lines are simple, materials are less fussy. In case you haven’t had a chance to get one of those trendy bowl-shaped sinks, they are going out of style. People are opting for under-mounted sinks. Pedestal sinks and sinks with legs are becoming popular. It looks like the whirlpool, jetted tubs are much less popular than they have been for the last two decades. 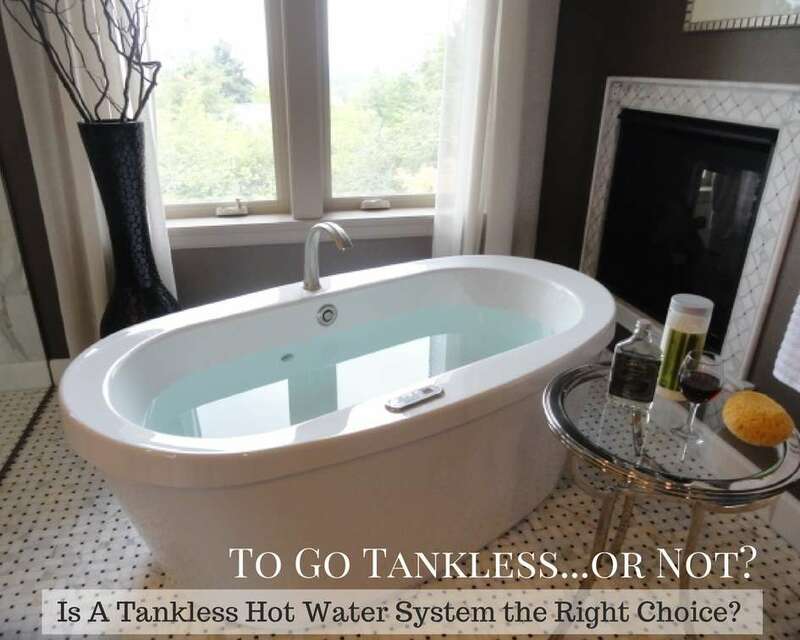 The above mentioned study showed that a huge 69% of bathtubs purchased for renovations have been soaking tubs. We must mention farmhouse in any article about design and decorating. Farmhouse style has become so popular with HGTV shows like Chip and Joanna Gains “Fixer Upper”. It has found it’s way to the bathroom. While contemporary styles are still the most popular, farmhouse has gained ground. There is a growing trend towards “modern farmhouse”, which is really an undefined style, bridging a lot of other styles. This makes for a better transition as you decorate and renovate. It also spreads a wide net to appeal to today’s home buyers. Like the design trends in the main living spaces of the home, the bathroom can easily be treated to industrial decor. Light fixtures, shower rods, exposed pipes and re-purposed industrial pieces are at home in the bathroom. A variety of metals can mix comfortably with industrial design. Expansive Walk-In showers, with various shower heads and spray systems. Multi-head showers are the epitome of luxury in a large shower. Door-less and curb-less showers are really hot. As mentioned earlier, they are great for seniors. More frequently, people are opting out of a bathtub. Or, to save space, more stand-alone tubs are being purchased. 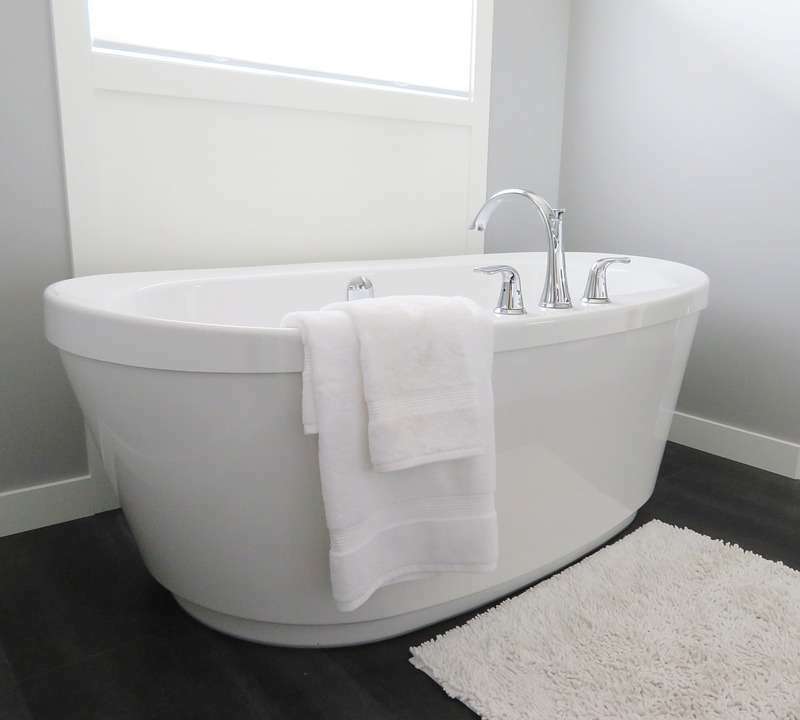 In the past, free-standing tubs have been very expensive designer features, but as demand goes up, generally prices come down. Hopefully this will be true for these gorgeous bathroom features. Thermostatic showers have been more popular, and steam showers have been added increasingly in bathroom renovations. For many years steam showers have been reported to have many health benefits. More people looking for a spa getaway at home are incorporating steam showers. For new homes, we’ll be seeing a fireplace in the bathroom for the ultimate luxury and comfort experience. Premium features are showing up commonly in toilets and showers. Among upgraded toilets, one-piece toilets are more and more common. The ease of care and cleaning have made this type of design very popular. These toilets fit in with the spa-like, zen appeal that is big. Double-flush mechanisms are common as well. Look for the price to come down as the demand increases. As the size of our showers increases, so does the demand for dual showers and specialty shower systems. Generally, bathroom renovators are focusing on style and good lighting when they determine where their dollars go. Smart homeowners still put an emphasis on what will add to the resale value of their home. There will be more individual spaces, zones—dedicated dressing and makeup areas. Water closets (separate toilet rooms) are very common in new homes and in renovations. If space allows, every woman wants a built-in vanity! The majority (83%) of bathroom renovations include the vanity and sink, with undermount sinks still the most popular. Most homeowners are fitting in double sinks if at all possible. Colors seem to fall in and out of favor quickly these days. Every paint company comes out with the “color-of-the-year”…and every new year you’re out of style! According to House Beautiful, the overall trend for several years has been moving to bolder and richer colors in the bathroom. The bathroom seems like a great place to play with color. It’s easy to change out curtains, towels and accessories in a bathroom without committing long term to colors that might end up dating your bathroom in a couple of years. Once again, gray seems to be the leading choice in color, in wall color, floor color, and in cabinets. White comes in second, and beige a close third. It is always wise to incorporate neutral colors in the permanent features, and decorate around them with colors that are trendy. While the style is becoming more minimalist and streamlined, many bathroom designers are balancing the clean lines with warmth, texture and furniture. The bathroom is being treated as one of the “heart of the home” spaces, just like the kitchen. You’ll find glossy wood, fabrics, and wallpaper. Mirrors are more than just functional, they can be of different shapes, full length, and backlighted, an addition to the overall design. While mixing metals is more popular in the kitchen, the bathroom is a smaller space, and renovators are still choosing a single metal for fixtures. Faucets, shower heads, valves, door hardware, lighting fixtures, towel rods, etc., are unified in the master bathroom. Among the matched fixtures, brushed or satin nickel is the top choice (38%), followed by polished chrome (28%). Quartz countertops are the new thing. Marble is also showing up in the newest designs. Granite is not as popular as it has been in the past, but still demand. Other innovative countertop materials that have been showing up in the kitchen are now showing up in bathrooms… like manufactured products, bamboo, concrete and recycled glass. Tile is still very popular. In the vanity backsplash, the shower and the floor. Brick patterns are most popular, followed by traditional grid patters, with herringbone being last on the list. Herringbone patterns show up in all the design magazines, but the public is not really buying into it. Perhaps they know it will look dated in a few years? People are smart, you know? Tile colors are many and can fit in with any design concept. Subway tile is also very trendy and compliments any design or color scheme. According to Remodeling Magazine, kitchens and baths sell homes. In the hottest housing markets, updating a kitchen or bath is often a good idea, with a return on investment nearing 100%. Washington D.C. and the surrounding areas are one of those hot markets. Keep bathroom design trends 2019 in mind. 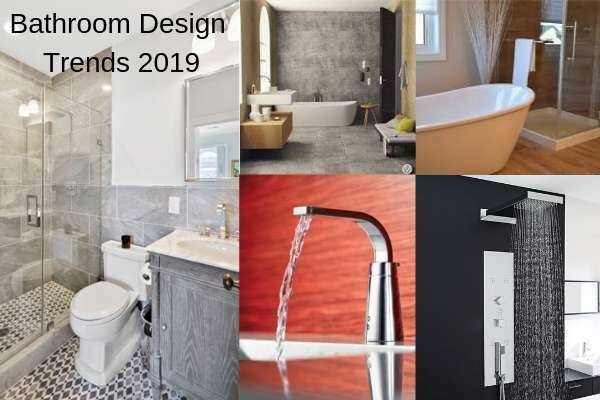 Bathroom Design Trends in 2019 for best return on investment. Whether you're selling your home or not, it's always a good idea to check out the latest bathroom design, color trends and decor trends. Are Stainless Steel Appliances Still Popular?